Shopping: 20% Off Loomstate T's At Barneys - Chicago This Weekend! Shopping: 20% Off Loomstate T’s At Barneys – Chicago This Weekend! Loomstate artists will customize new t-shirt purchases! 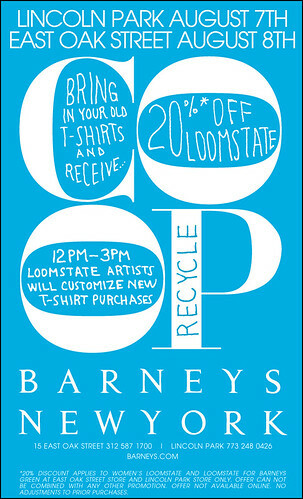 Recycle…Bring in your old t-shirts and receive 20% off your handpainted, one-of-a-kind t-shirt.